Ford and GM both report their 2011 sales growth in China exceeded overall market growth. SHANGHAI TheStreet) -- Ford ( F - Get Report) and General Motors ( F - Get Report) both reported record China sales in 2011. GM, the market leader in China, said sales rose 8.3% to 2,547,171 vehicles, a result of record domestic demand. Ford said sales rose 7% to 519,390 units. Sales by both U.S. automakers exceeded the estimated overall Chinese growth rate of 3% to 5%, as sales by Japanese automakers slumped on supply problems.Like all U.S. companies, Ford and GM operates in China with joint venture partners. "GM stayed ahead of the competition despite a slowdown in the growth of industry demand thanks to our broad portfolio of appealing vehicles," said Kevin Wale, president and managing director of the GM China Group, in a prepared statement. "GM and our joint ventures introduced 12 new models in 2011 while expanding our manufacturing and product development capability to meet rising demand. "This year will be equally promising for GM in China," Wale added. "We expect the market for both passenger and commercial vehicles to continue to expand, particularly in China's Tier 3 and Tier 4 cities." 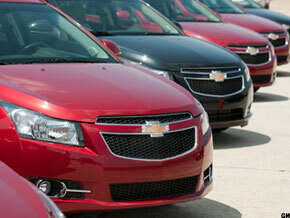 Among GM brands, Buick sales rose 17.4% to 645,537 vehicles, while Chevrolet sales rose 9.4% to 595,068 units. The brand's best seller was the Cruze (pictured) with 221,196 units. Cadillac sales rose 73% to 30,008 units. Shanghai GM was China's passenger car sales leader in 2011, as sales rose 16.2% to1,200,355 vehicles. SAIC-GM-Wuling was the domestic sales leader among mini-commercial vehicle manufacturers, as sales rose 4.8% to 1,285,820 vehicles. GM has 2,700 dealers in China, its largest global market. At Ford, meanwhile, "our strong sales performance in 2011 shows that Ford is on track to deliver on its promise to bring 15 new vehicles to China by 2015," said David Schoch, CEO of Ford Motor China, in a prepared statement. Ford and its partners are adding four new plants in China, including a vehicle assembly plant in Chongqing that will come online in 2012." Sales at Ford's biggest China joint venture, with Changan Ford Mazda Automobile, grew 5% to 320,658 units.